People don’t think very highly of rats. Unfairly, rats are thought of as sneaky, sniveling creatures, the lowest in the mammalian group. These small creatures are very intelligent which is why they are so often used in scientific experiments. In some research studies, rats even outperform humans. Rats, like most rodents, are highly active. They love toys, playing, and having a job to do. If you keep a rat as a pet, keeping them engaged in various exercises is a must and teaching them tricks can be a part of their daily routine. First, find out what your rat’s favorite food is. Rats eat pretty much anything and everything so discovering a reward should be easy. Is it dried fruit? Fresh fruit? Veggies? Popcorn? Make sure it is a healthy treat as you will probably have to dole them out quite often. Second, choose your new trick. Do you want to teach them to follow directions? Play a game? Go through a maze? You want to start with a simple trick – we don’t learn math by starting with calculus! The simplest tricks are like those you would teach dogs. For example, you can teach your rat to stand on his hind legs. Rats have good eyesight and hearing so you can say the word “up” while holding your thumb and index finger with a small treat pinched between them a few inches above his head. He will rise on his hind legs to get the treat. At some point, he will automatically rise when he hears you say, “Up!” Make sure you administer a treat immediately afterwards so that he associates the word with the reward. When your rat gets more experience behind him, you can teach him some more intricate exercises. According to Harvard University research, rats can distinguish 2D and 3D shapes and they have excellent spatial reasoning skills with shapes and objects. This is an area where they excelled in experiments and surpassed their human competition. One game is to have your rat pick out 2D or 3D shapes and colors. What you’ll need – wooden blocks and cut outs of shapes with those same shapes. These shapes should be of different colors. You can find the blocks in toy sections of stores and they come in shapes such as hearts, stars, circles, and cubes. Set the 2D circle and 3D sphere up. Have the rat continuously come to the 3D circle using your rewards system. After he has identified the 3D circle repeatedly without fail move on to the square and cube or the 2D and 3D star or heart. Your rat should identify the 3D shapes without prompting. However, immediately give him the treat when he correctly picks out the subsequent 3D shapes! Add your own touches to this sketch. You can make it more elaborate by using throwaway items such as cardboard boxes, wrapping paper, and ribbons. The key to successfully teaching your rat tricks is to be consistent. Always administer treats immediately after they do something correctly. Don’t change the rules to your games to avoid confusion. Train them on the same trick repeatedly – practice makes perfect! Rats are known not only to be intelligent but also affectionate. In fact, they are known to be more affectionate than hamsters, gerbils, and guinea pigs. 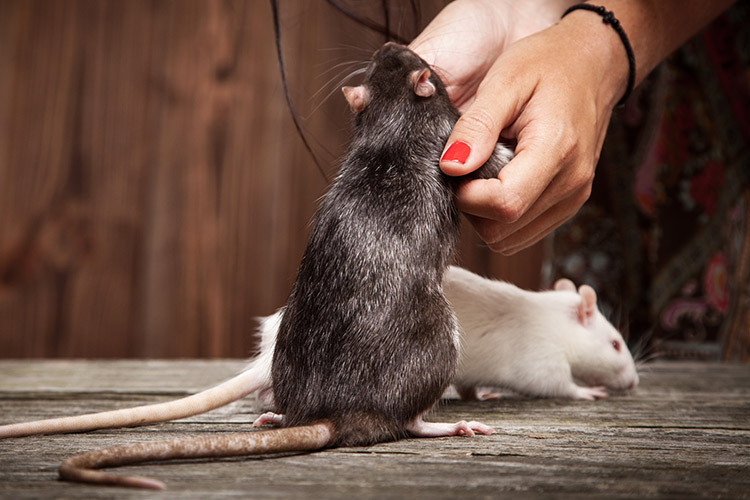 Rats bond with people and will be your best friend when you have earned their trust!